On Saturday, at my last fair, there were some of the stall holders that I had met at my first fair in September, this included Jane Eastman, a jewellery designer, her website is at Tideline Design. 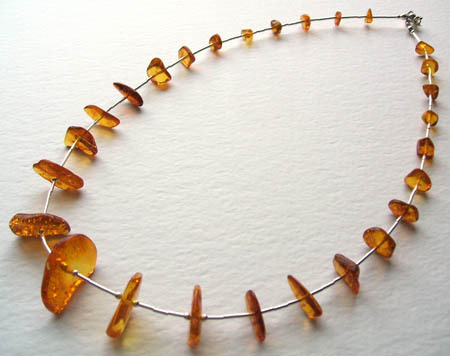 At the fair in September I had admired one of her necklaces greatly, as I love amber, and I thought was a very unusual way of using it. I dropped a great many unsubtle hints to my mother-in-law, and she bought it for me as a Christams present! Isn’t it lovely, beautiful, and it is so light and airy, both to look at and wear. I’m really not a wearer of jewellery, but when something is this stunning, how can I not! God that is absolutely beautiful. I’d wear it as much as possible too, even mucking out the pigs … if I had pigs! That’s gorgeous. 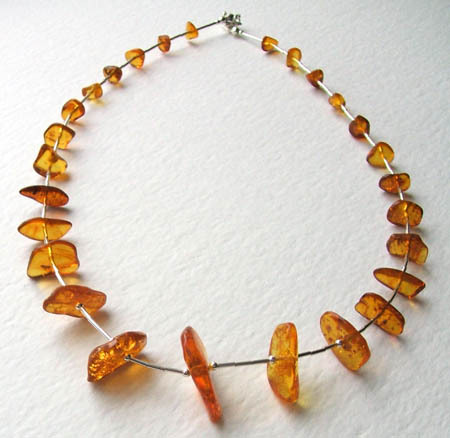 I love amber too – have a nugget that I wear as a pendant on a rawhide string – but this piece is something special – elegant and very beautiful in an elemental way. So, so beautiful. Wear everywhere! Unsubtle hints are definitely the best if you get gorgeous gifts like that.